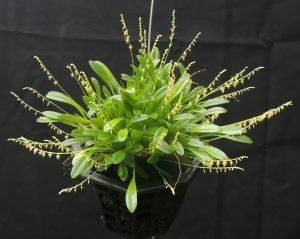 We have featured several miniature orchids in the last week and here is a really spectacular little species. 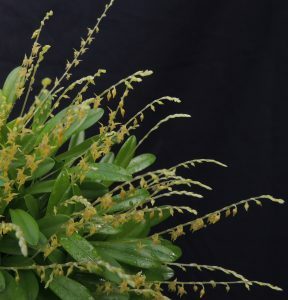 The plant shown has now completely filled its 8cm basket and produces a multitude of little starry flowers about 2mm across from the bright green 2cm leaves. This tiny miniature is native to cloud forests in Colombia at around 2000m and enjoys a shady spot with heavy watering throughout the year. 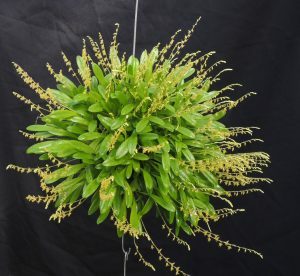 The flowers are amazingly long lasting and we expect this plant to still be in full flower in two months time. We grow plants successfully in pots and baskets and expect they would do well mounted to. Plants bulk up quickly so all in all a lovely little species to grow. A year ago the plant shown looked like this (photo below) showing just how quickly the species can grow when really happy. 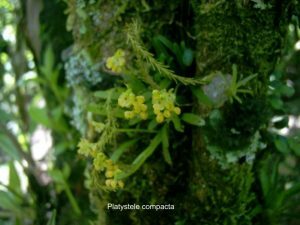 We have seen several Platystele species in their natural habitats and most have been tiny miniatures but all have had charming starry flowers. The smallest species of orchid we have found on any of our trips was this Platystele compacta in Costa Rica. The whole plant is less than 2cm across.